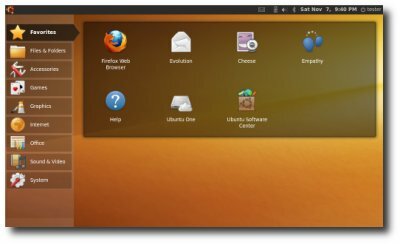 Ubuntu Netbook Remix is a custom user interface for the popular Ubuntu Linux distribution designed to play well with laptops with small screens. Instead of dealing with a panel and a series of drop down menus, Ubuntu Netbook Edition has a series of categories on the left side. Click on Accessories, Games, Internet, Office, or another category to bring up a series of large icons for accessing the associated programs and settings. It’s also tweaked with optimizations for Intel Atom processors. According to this blueprint, folks at Canonical are getting ready to help “Ubuntu Netbook Remix” change to “Ubuntu Netbook Edition” status. It seems that the they have removed the blueprint. Here is the link to the cached copy by google.